I’ve given up on new year’s resolutions. Instead, I spend all year searching for the perfect apps to keep me more organized in the next year. Here are four perennial favorites that have literally saved my sanity this past year. These are the apps I put on my friends’ phones. These are the services I make my mom sign up for. These are the apps and services that are responsible for any semblance of organization in my digital life. Dropbox is where my files live. When I need to save something–whether it’s a Word document or a backup–I skip My Documents and go directly to Dropbox. It looks just like My Documents, with topical folders I’ve created to organize my various files. But the difference is that when I save a file to Dropbox, it is instantly backed up to the cloud. I can save a file on my computer, leave the house, and instantly access the updated file via my phone or tablet. Dropbox means that I don’t have to freak out if my computer starts acting funny. My files are safe, even if my motherboard crashes. Thanks to Dropbox, I can access the same files from any computer or device, any time, without any cumbersome cords, emails, or flash drives. Dropbox saves me from the literal nightmare of my computer crashing when I have no recent physical backup. Dropbox accounts are free and come with 2GB free space. Use my referral link when you sign up to get 500MB extra space. Plus, install the apps and invite your friends to earn additional space. If you find you need more (which you shouldn’t if you’re just backup up general word processing files), upgrade to 1TB storage with Dropbox Pro for $9.99/month, or get unlimited space with Dropbox Business for $15/month. Get Dropbox and Get 500MB Extra Space! If you work all day long in Google products, or are a Google Apps user, you might prefer Google Drive. Google Drive comes with 15GB free storage (shared with Gmail and Google Photos). Upgrade to anywhere from 100GB ($1.99/month) to 30TB ($299.99/month). While I use Google Drive for multi-author documents, I do prefer the more premium features of my free Dropbox account. Evernote is my digital brain. It’s the compilation of everything from the multitudinous sticky notes and lists scrawled on the back of envelopes to post drafts to lecture notes. Organized by individual “notes” within “notebooks”, Evernote thinks like I do. And the search function makes it a breeze to find anything I forgot to tag or file in the right notebook. Evernote means that those numbers and details that I’m always having to reference at the oddest times are accessible from my phone–and easily shared with my husband (I created him his own Evernote account so that I can share only the pertinent notes and notebooks with him, giving him a more uncluttered Evernote experience). Thanks to Evernote, I never have to wonder where I copied that bit of code or where I took notes for that one class–it’s all there, in one place. So are my children’s weight records, cute things the kids say, favorite quotes, even the mailing addresses of friends I want to send Christmas letters. I snap a picture of clothes I loan out and document it in Evernote. I take notes for future articles I want to write or phone conversations I’m planning to have. If I need to write it down and find it again later, I write it down in Evernote. Evernote Premium offers an expansive suite of additional features, but I’ve never had a need for more than the ever-free version of Evernote. If you’re an everyday user of the Microsoft Office suite of programs, Microsoft OneNote might be more your style for digital note-taking. It looks and feels like a Microsoft program, and of course, integrates with all things Microsoft. LastPass is a password manager that allows you to remember just one “last password”, and happily forget all the rest. Import any passwords saved in your browser, perform a security audit on your current passwords, effortlessly generate and save secure passwords when you’re creating a new account–all in one service. Some may debate the security of keeping all your passwords in one service, but I have decided to trust in the security of a company whose reputation is their security. I know it’s more secure than a Word or Excel document on my computer named “passwords”. And it’s certainly a whole lot more accessible! The browser extensions offer auto-fill, password vault search, and easy copying of a specific password for insertion anywhere it’s needed. But LastPass doesn’t just store my own passwords. It’s also a secure way for my clients to share their passwords without me ever seeing the actual password–and they can rescind access when the job is done. But perhaps my favorite use of LastPass is the folders I’ve created within my own account for the digital accounts I manage for others. Instead of my mother-in-law trying to track down the paper where I’ve printed the list of her LastPass passwords, I can just look it up in my own LastPass account and save us both the headache of locked accounts or reset passwords. LastPass is free for use on your computer and on Android devices. For unlimited sync with all devices, you’ll need the Premium subscription. To me, $12/year is a small price to pay for the ability to access my passwords anywhere, on any device. Initially, I chose LastPass because of the price–you can’t beat free. But if you’re looking for a premium service at a premium cost, there are other options. 1Password is one of the other most popular options (and includes more than just password storage), but Lifehacker has a great run-down if you really want to check them all out. Based on the reviews and features, I still love the ease and accessibility of LastPass. When I got a digital camera, my ability to take pictures became virtually unlimited. When my husband got an iPhone, suddenly he was taking as many or more pictures than I was. And slowly, our collection of digital photos began to take on epic proportions. It was my love of Dropbox and the way it instantly backed up the photos I take on my phone that drove me to find an unlimited digital photo backup solution. I loved having the photos I took with my cell phone accessible anywhere, but I wanted to have the photos I took with my digital camera available in the same way. I explored so many options, only to find them capped at 1TB of storage or reducing the quality of my images to lessen the demands on their backup system. I’d just about given up when I realized that perhaps I needed a solution geared more towards professional photographers. My photographer friend Jenni Marie saved the day–and my digital photo collection–when she recommended SmugMug. With features for everyone from the professional photographer to the family photo enthusiast, SmugMug offers secure, unlimited photo storage and sharing at unbeatable price options. You can add your images to galleries, organize galleries into folders, and “collect” photos into any number of galleries. I have created a gallery for the great-grandparents, a gallery for each of my sisters-in-law, and of course, a gallery for my mom. Now, instead of emailing them the extra pictures I don’t put on Instagram or Facebook, I just add the photos to the gallery of the person I think would enjoy them. Instantly, the photos show up on the grandparents’ iPad in the SmugMug app where they can enjoy them anytime (without going back through old emails!). After a big family Christmas with like we just had, I uploaded my photos to a new gallery and shared it with everyone who was there. Then, I sent them the private upload link so they could easily add their own images from their phone or camera to the private gallery–all without them having to log in anywhere or pay for their own account. SmugMug means that I can share original digital images without flooding email inboxes, clogging social media feeds, or using mobile data by texting the cell phone shots. But even more importantly, SmugMug means that my photos are accessible anywhere, anytime, on any device–and are securely backed up by a service trusted by professional photographers for over 13 years. SmugMug offers unlimited storage of original, full-resolution photos–and HD videos–starting at just $3.34/month. I chose the “Power” plan ($5/month) because it gave me complete control over sharing options, but the . Google Photos does a one-way sync of anything you put in the folders specified in your Google Photos settings. That makes it great for a no-brainer photo backup or a secondary backup solution. But there’s a catch to the “unlimited free storage”: it reduces photo quality. Upgrades to the limited free storage come at the same rate as the Google Drive upgrades (your 15GB of free limited storage is shared between Google Drive, Gmail, and Photos). I prefer the control, privacy, and customer service SmugMug offers me–not to mention unlimited photo storage for an unbeatable price. I’d love to hear about the services that have kept you organized this past year! Great recommendations! I use Google Drive, Evernote, LastPass, and Amazon Prime Photos. Free unlimited photo storage is a perk of Amazon Prime, with automatic backup from our phones straight to cloud so I don’t worry about losing a picture. We can delete all the photos from our phones to save space, because the pictures are backed up. Thank you for this list. I already use Dropbox, but Evernote sounds like a service I could benefit from, probably more accessible (and retrievable) than my colored sticky notes on paper. Hello, Gretchen! A belated Merry Christmas and wishes for a blessed 2016. You have included some of my sanity-saving apps: (1) Evernote keeps track of everything in my writing life, including research for my memoir I’m writing; (2) NoteOne keeps up with favorite quotations and Scriptures, language I might need again and again to paste into a post, health stuff, family research and pix; (3) LastPass really protects my sanity–need I say more? ; and (4) DropBox and Google Drive vie equally for my attention–I use them equally I think. 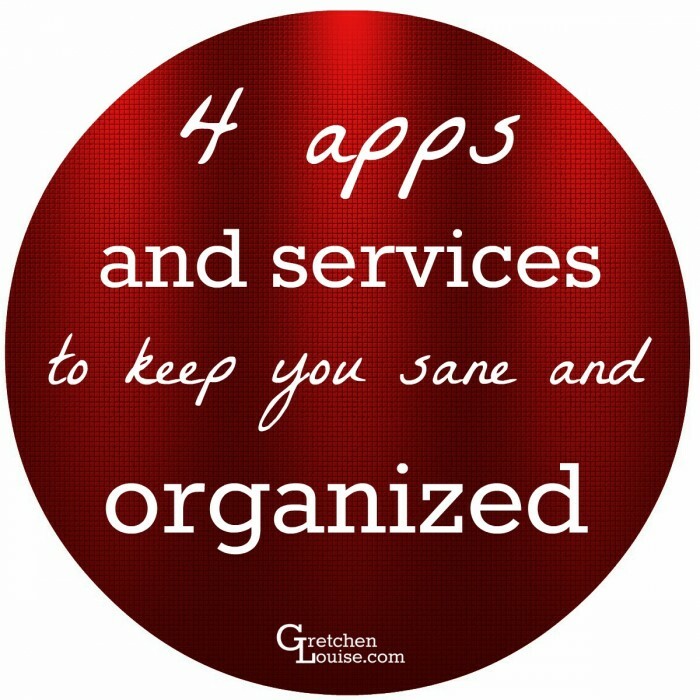 It was interesting to learn what your favorite sanity and organizational savers are! Off to read your family letter! Gretchen, thank you so much for this article. I appreciate your explanations for the apps. I’ll be adding some to my devices. And I’ll share your article via Facebook. You’re so welcome! Hope you find them helpful. Any time I have a question, no matter how basic, Gretchen is there to answer it. Gretchen is incredibly patient, cheerful, professional, and a fantastic communicator.